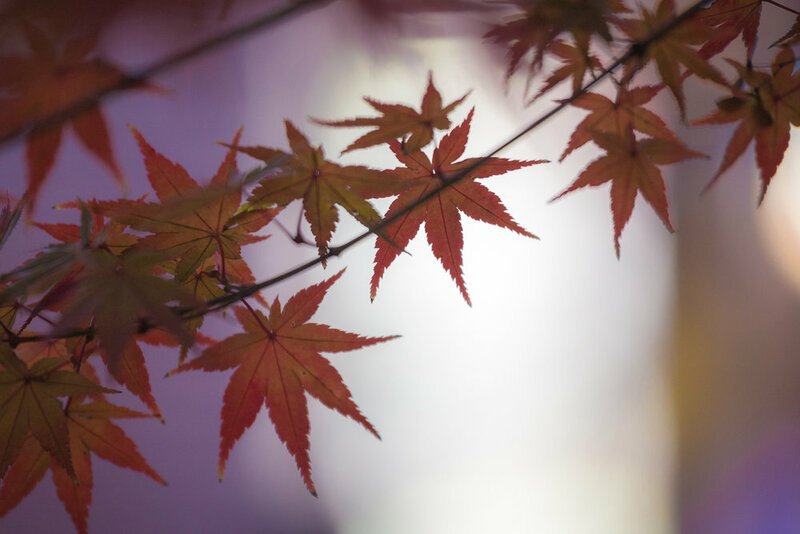 Fall is a beautiful, but busy time for me in Japan. My school is recruiting students for the following school year (which starts in April) so I have to work quite a few Saturdays, greeting parents of prospective students. And, this year, I am finally starting to get a few photo jobs (since summer, I have done a family portrait session, a 753 session, a dance school practice, a dress rehearsal by the local theater group...) so I really haven't had a chance to get out to some of the more famous spots in the area for fall colors. I also don't like big crowds, so have purposely avoided places like Korankei, which is renowned in this area for its maple tree lined river. I will put up with big crowds for a festival, but trying to take pristine nature photographs while standing next to hundreds of others photographing the same things always feels a bit counter-intuitive to me. So instead, I look for spots with fewer trees that are lesser known, and attract fewer people. This means my fall photographs tend to be tightly framed, maybe focusing on only one or two trees, rather than on a colorful hillside. It's limiting, but it's also the kind of challenge that forces me to consider my framing more carefully. 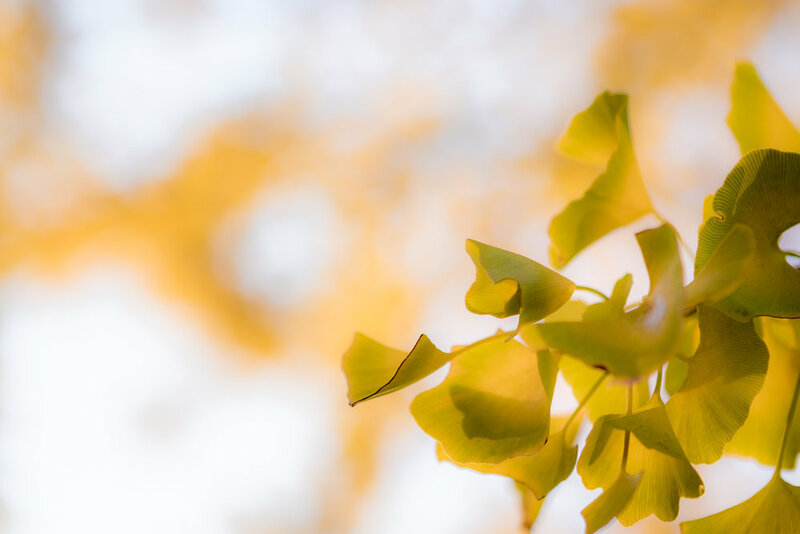 When you are facing a hill covered in fall foliage, the "shot" is already somewhat decided, but when you are looking for individual leaves to focus on there are more choices to be made. Which leaf do you choose? 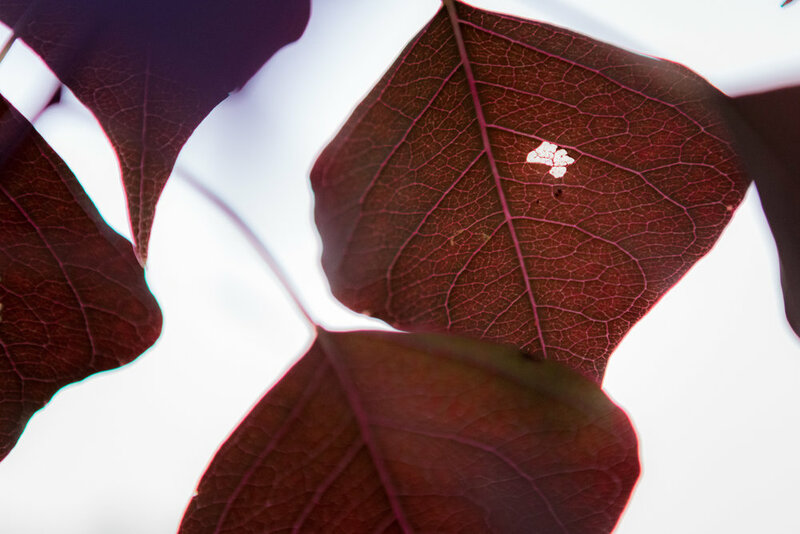 Do you look for a perfect leaf? How shallow should your focal point be? 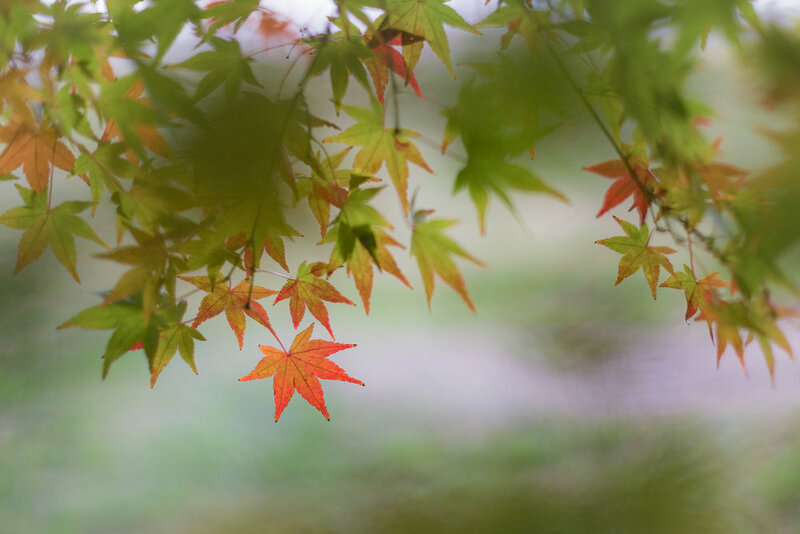 Should you include leaves in the foreground, or in the background, or both? So, the three places I went to see fall colors this year are all local. The first was Heiwa Koen Park, where I have often taken photos of crows and sparrows in the past, and which is on my way to school. During my bike rides to school, I was able to mark the tonal progression of the leaves, starting with the sakura trees (which turn early) and culminating with the more dramatically colored momiji (maples). There are not so many momiji trees in Heiwa Koen, but the overall sense of seasonal change in the park is still striking and fun to observe from day to day. The second location I visited was my local woods, Idaka Ryokuchi Koen. Idaka is not renowned for fall colors. It has a lot of bamboo and other non-deciduous trees, and there are only a few momiji trees that I know of. But, it is mostly preserved in its natural state, and is a great place to get a way from people. 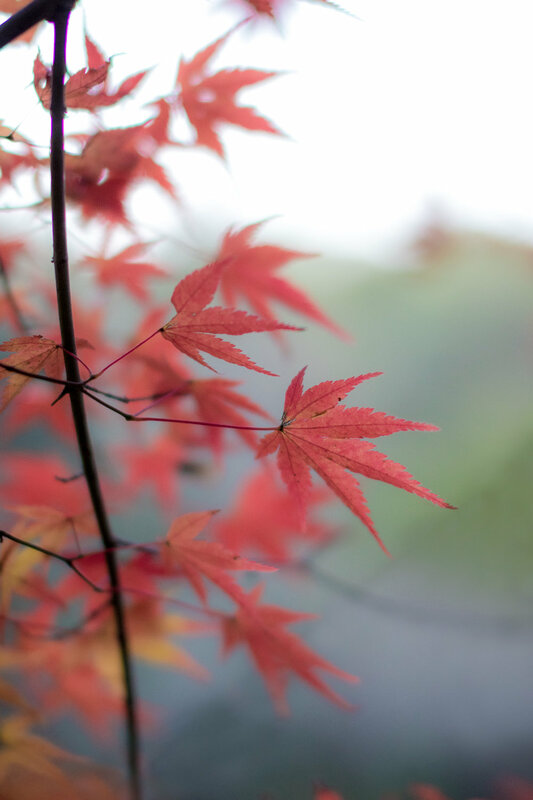 These photos are all of one particular momiji tree with low-hanging branches, that squats beneath a much larger tree of a different variety. When I discovered it, it was covered in large, brown leaves that had fallen from the tree above, so I carefully shook and picked out the alien leaves so they would not be a distraction. Then, I crawled in under the canopy of leaves, and squirred my camera in amongst the branches to pick my frames. The last place I visited was Meijo Koen. I had gone to see a theater production in the area, so on the way home I stopped off to get a few snaps. By this time (late November), most of the maple trees had started turning, and the more brilliant colors were showing up. It was more crowded than Heiwa Koen or Idaka, but still nothing like the crowds that Korankei or Kyoto attract. By now, most of the deciduous leaves have fallen, so this will be my one, and only, fall colors blog post for 2017. I've seen some really stunning photos posted recently on Instagram and Facebook, taken in Korankei, Kyoto, and other famous sites. and, a part of me always feels envious that those photographers were able to visit those lauded spots. But, then I remind myself that there is actually plenty of beauty to be found locally, and the lack of people means my chances of getting an original shot are greater. That should count for something.